Notes: The Bird's Nest is a nymph pattern designed by the late Cal Bird in 1959. Cal was a master fly tier, who owned a small fly shop in San Francisco in the 40's and 50's. Cal developed this fly for the Truckee River. 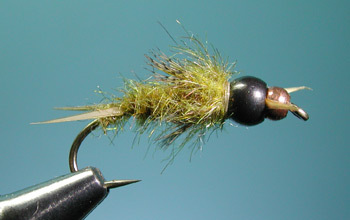 Usually tied in tan colors to imitate caddis pupae, other colors used are cream, brown, and olive. Cal actually used a blend of Australian Opossum and dyed Coyote for the dubbed body. He also insisted on Woodduck flank for the tail and hackle to achieve the proper stiffness. Often, other flytiers will substitute Teal or Mallard Flank and utilize Haretron or a similar dubbing for the body. According to Ralph Cutter in his fine book, "Fish Food" (2005), Cal claimed that he gave the fly it's distinctive name due to an entanglement with a bird's nest while on the Truckee and that the name should be spelled with a lowercase 'b'. Their mutual friend, Polly Rosborough, hinted that it may have gained a different spelling after he chided Cal upon naming a fly after himself. You might notice that the pattern also uses Polly Rosborough's technique of "tying in the round", which was particularly popular during the 1950's. Another interesting feature is the rougher thorax with more protruding fibers. Frank Matarelli designed a hook, known as Cal Bird's Dubbing Tool, This tool is used within the "improved" Bird's Nest to create a dubbing loop in which the Opossum dubbing is applied for a more buggy look on the thorax. The Bird's Nest is generally considered an attractor pattern that can be fished on a dead drift, either weighted or unweighted. 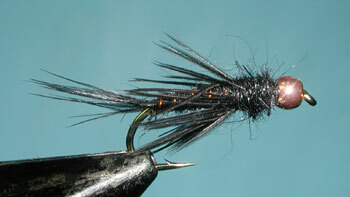 Sierra guide, Ralph Cutter, prefers to use this pattern for hatches of the Swimming Nymphs, Siphlonuridae, which include the Gray Drakes, Black Drakes, and Ameletus. He will use short strips which gives the Bird's Nest a lively action with the hairs of the body pulsating to the action of the Woodduck hackle. The Bird's Nest is often tied with beads of copper, gold, or black. 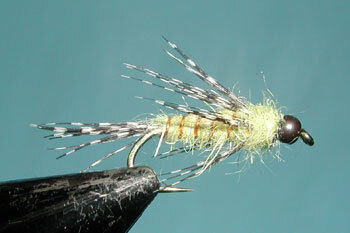 Harry Mason has an excellent tutorial on this fly at his web site: Troutflies. Variations on the Bird's Nest include Ken Morrish's Dirty Bird. 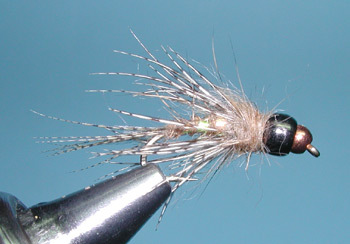 Ken's fly is usually tied in Rust, Olive, and Natural Hare's Ear. 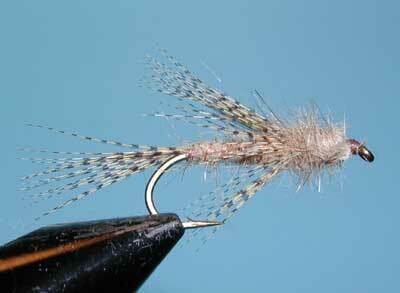 It is a popular Steelhead fly in larger sizes of 6 and 8 but can be a good trout fly in the smaller sizes. Greg Vinci added an additional Tungsten bead and a tungsten wire underbody (Tungsten wire is popular in Europe but very dificult to find in the U.S.). He call's his variation, Depth Charge Bird's Nest. 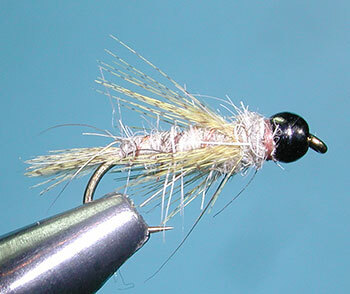 Tied in sizes #14-16, the Depth Charge represents Caddis Pupae. In slightly larger sizes #10-14, the pattern is more of an attractor pattern. 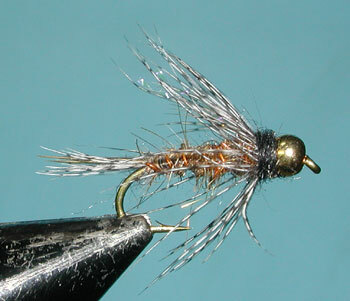 Greg will also tie this pattern in sizes # 6-10 using Ginger or Golden Stone Goose Biots for the tails and antennae to represent a stonefly nymph pattern. 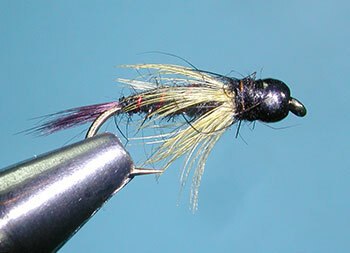 Sierra Drifter Guide, Tom Loe, came up with his version that he ties in a light and dark variation. He named this variation, Assassin. The tail material are tips of Blood Marabou which give a gracefull action within stillwater situations and can mimic small baitfish such as Perch Fry or Damsel Nymphs.